We don’t cling to hope, but to God, our living hope. Sometimes our hopes are crushed. Other times, they seem so far off that we can begin to wonder if our hopes will ever be fulfilled. Have you ever been there? And still we hope. God made us to be people of hope, but sometimes we can get confused on how to hope and what our hopes should be at all. How do we hope without making our hope an idol? How do we hope and surrender at the same time? The object of our hope disappoints when it is found in the temporal. The object of our hope disappoints when it is found in the temporal. Only an eternal hope is capable of truly delivering hope that prevails. But while we are in these casings of flesh, we are prone to hope in something we can touch and feel . . . that we can see. Going from hope to hope, we long to be satisfied, but all hopes fall short of the one hope that will finally give us the peace we long for. Only an eternal hope is capable of truly delivering hope that prevails. When our hope is or outcomes in this world, rather than in the Author of this world, our hope is fragile. We can hurt when we hope for healing and it does not come. It was a good hope, after all. We become disillusioned when our hope for success is met with defeat. Again. We can even doubt God’s goodness when He does not meet our hope. Perhaps we had the wrong idea about hope, after all. Maybe our hope was only supposed to be in one place – in Christ. In the glorious Gospel – the Good News of His salvation. That one day we will be in His presence, redeemed. And now, while we wait, we get distracted by lesser hopes that vie for our attention. We were never meant to feel fully satisfied here. This is not our home. When we hang onto hopes of this world, we are left wanting. Dependent upon fulfilled hopes for life. But when we hang onto the one true hope, Jesus Christ, that hope will never disappoint. And this hope lives inside of us. Resident inside of man! Hope might not be visible, but it is palpable to those who have received the gift of salvation and the deposit of the Holy Spirit, speaking messages of hope to urge us on in this life. 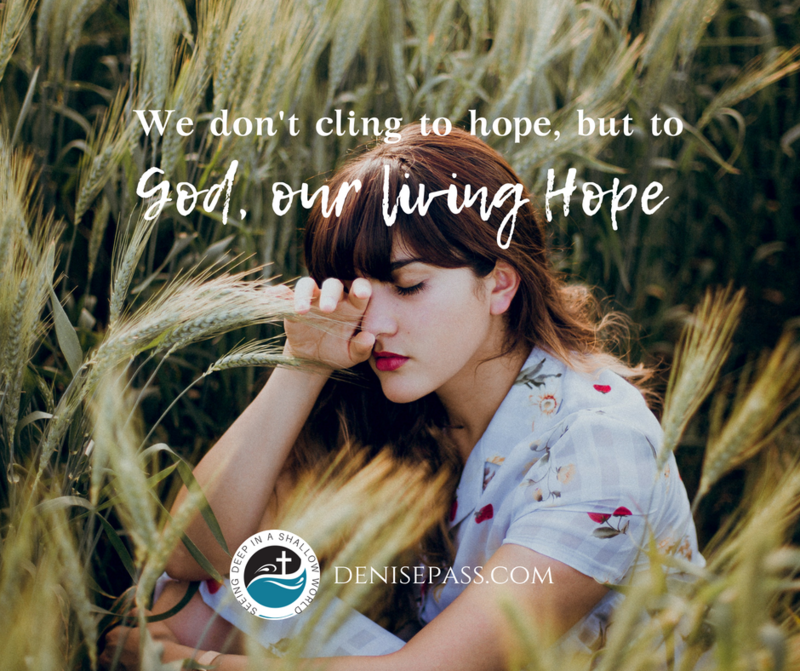 So, then, the secret to hanging onto hope in life’s bitter storms is that we do not cling to hope, but to God, our living Hope. And this hope is nearby . . . He inhabits imperfect clay vessels and breathes hope into seemingly hopeless situations. His purposes go much deeper than meeting our earthly hopes. Our hopes matter to God, but He longs to use everything to help us see what we were made for – to know Him and to trust Him – when our hopes are met and when they are not. He is good in all of it. The secret to hanging onto hope in life’s bitter storms is that we do not cling to hope, but to God, our living Hope. Need hope today? Jesus loves you, friend. Maybe you have felt shame for unfulfilled hopes. If so, come and hang with me with my new book, “Shame Off You”. God is for you and will never leave or forsake you. This fallen world is hard to navigate, but He is there for you. Always. Shame Off You – your hope can be fulfilled in Christ. You can pre-buy Shame Off You now and get the first few chapters along with a Scripture resource guide, journal and poster. Click below for details! Thank you, DeJama. Praise His Name! Perfect! This Tuesday morning needed THIS. Heart is much less heavy now; lifted up by this reminder. Thank you! Oh how GOD uses you… blessed post. So grateful to be used to tell of His greatness! Thank you, friend! Thank you, Noelle. So glad to hear it! God is our ONLY hope! Oftentimes people and circumstances can defeat us and break our heart. Clinging to the ONLY hope, our precious Lord, allows us to persevere. Than k you for your faithfulness to listen to Him! Yes! His hope endures forever because He is our eternal God. Love Him! Thanks, friend! “The object of our hope disappoints when it is found in the temporal.” This is such a powerful reminder as we journey through this life, a life that can be filled with disappointments and hardships. Thanks for sharing such a timely and powerful word. Thank you, Andrea. Love to contemplate on His incredible truths. Thanks for journeying with me here! Thank you for this article. It gives me more hope and peace for my life and for the future. Amen! We have hope! 🙂 So glad to hear this encouraged you. Thank you, Janet. Always trust in Him and know He is faithful and true. Giving thanks for the continued blessings and messages that are right on time! Amen. Yes, He is always faithful and true. Always. Praise Him! Thank you, Denise. Such a great post.